Whether you're just starting your college education, interested in changing careers, or looking for classes to enrich your life, HCC can help you achieve your goals. For those seeking a certificate, degree, or credits to transfer to a four-year institution, we offer hundreds of courses and nearly 100 degree and certificate options, plus extensive support to help you succeed. Holyoke Community College is a public institution of higher education with an open admission policy. General requirements for admission to a degree or certificate program include a high school diploma, General Education Development (GED) or HiSET certificate, or completion of an approved home schooling program. Wherever you want to go, HCC can help you get there. Looking for a top-notch education, outstanding professors, and an array of academic support? Ready to explore your career options, try out an internship, and discover the perfect future for you? Want a college that buzzes with activities and events, and supports a boatload of student clubs and sports teams (not to mention a state-of-the-art fitness center)? Of course you do! Luckily for you, it's all at HCC. If you previously attended HCC but have been away for one full semester (or more), you are considered a readmit student. Welcome back! Head to the New, Readmit & Transfer page for steps to enroll, and you'll be registered for classes in no time. If you're a junior or senior enrolled in a high school or a home school program who wants to take college courses now, HCC's dual enrollment program offers a unique learning experience for motivated students. 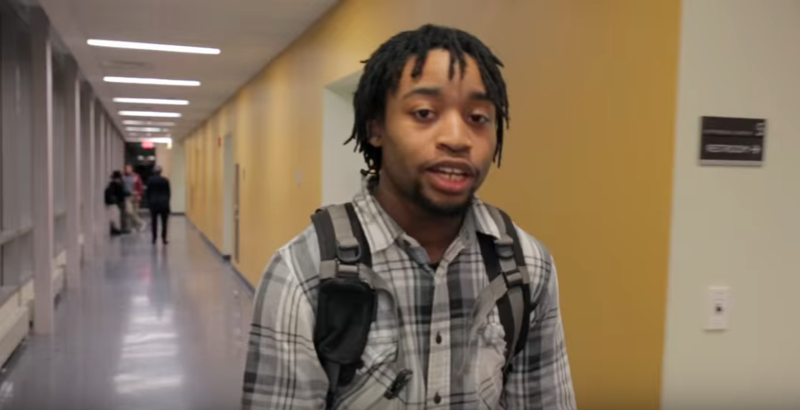 You'll have the chance to experience HCC's academic rigor and classroom diversity, while earning both high school and college credit at an affordable price. Whether you opt for a full- or part-time course load, you're considered an HCC student and can take advantage of all our resources and participate in campus activities. The college credit you earn through the dual enrollment program transfers to many two-year and four-year colleges, both public and private. HCC enrolls a diverse group of international students whose backgrounds and talents enhance the educational experience. 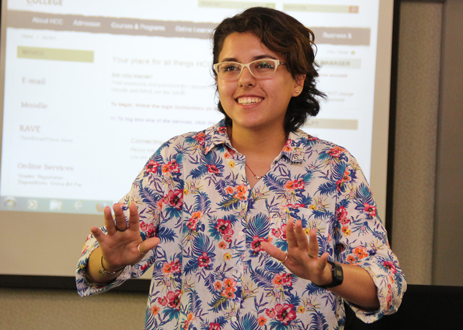 With a wealth of support services for first-year college students, returning college students, and speakers of other languages, international students thrive at HCC. Many of our students have gone on to study at baccalaureate colleges and universities throughout the United States. See what our international students have to say. For those seeking personal enrichment, HCC offers non-credit classes in everything from aerobics to wine tasting. Want to advance your career? The Kittredge Center for Business and Workforce Development offers professional development classes and workshops, certificate programs, preparation for licensure tests, and testing. Non-credit students don't need to apply to HCC; go directly to Business & Community Education Services to get started. It is important to note that undocumented and DACA students are not eligible for state or federal financial aid (including grants, loans, and federal work-study). However, students are encouraged to apply for scholarships and take advantage of the HCC payment plan. DACA students who have received a John and Abigail Adams Scholarship are eligible for tuition credit. We understand that the process for DACA students may be confusing, and we are here to answer any questions you may have. Please contact the Office of Admissions at 413.552.2321 or admissions@hcc.edu. You can also visit the links below to get more information about DACA. Flexible schedules, affordable classes, and endless opportunity. 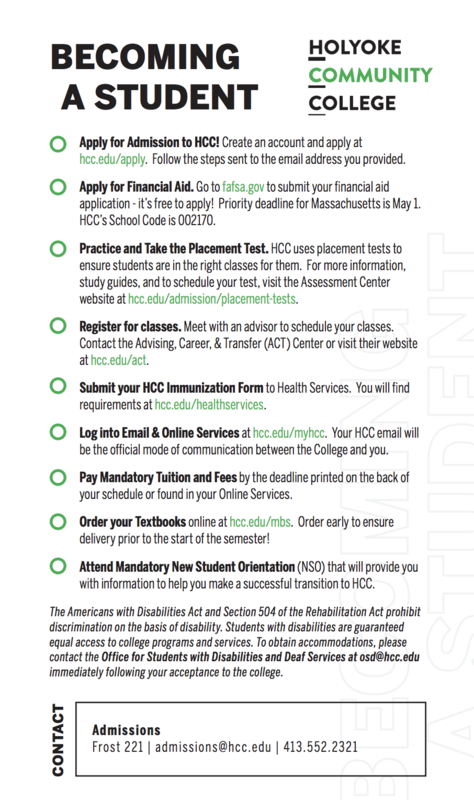 Learn more about HCC, and schedule your visit to campus today. Education is the key to growing, and it's the key to achieving greatness."